ProTem transforming dementia care Moncton is a premiere dementia care home. Traditionally, people with dementia have been housed in nursing homes with limited stimulation. No one understood there were ways to reach them. They’d become agitated and no one understood what to do about that, other than medication. You’ve probably seen pictures or visited a facility like this, with the halls lined with people in wheelchairs slouched over, eyes closed…enduring the day until they can be in bed. Month after month. Year in and year out. At ProTem, we don’t think it should be this way. We believe our job is to do everything in our power to help preserve each individual’s dignity and personhood just as long as possible. We use research-backed science-based methods that ‘turn-on’ a part of the brain that isn’t affected by the disease. As a result, we’re able to reach our seniors in ways traditional care can’t. Our caregivers take their role to heart so that it’s more of a life – calling than a job. They’re dedicated to the mission and live every day to enrich the lives, emotions, and momentary pleasures of people like your loved one. They connect with them, spend time with them, interact and have close personal experiences with them every day. Whether walking together in the raised garden plots, listening to music, cooking alongside, sharing painting projects, sipping tea and chatting, reading, or whatever is needed, every moment is a priceless opportunity to draw them out, help them connect with their own identity and their loved ones and friends, and with the beauty around them. We know we’re different. But we’d like to see memory care homes follow this care-path everywhere. 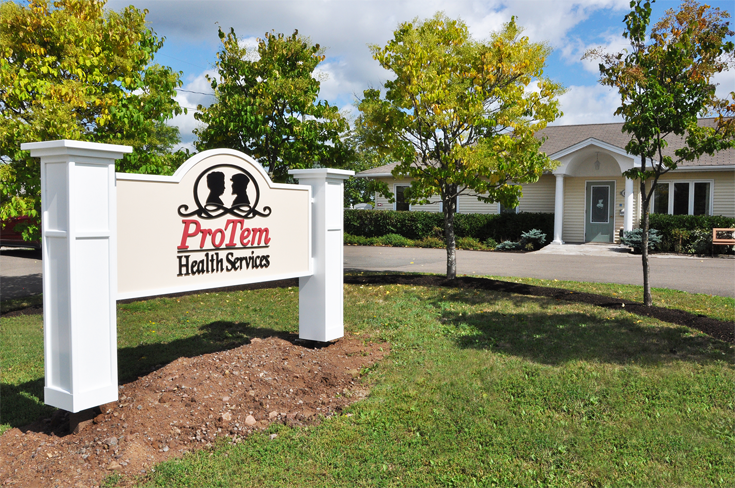 We’re proud of our program and believe ProTem is transforming memory care in Atlantic Canada. Our residents are the beneficiaries and that’s the way it should be. Many may be unaware of the quality of life a person with dementia can experience. Outdated facilities where these special people are allowed to sit the day out in a wheelchair with their heads bent over are missing the wonder of how alive these individuals can be. ProTem is not a place where people with dementia come to wait for their life to end. It’s a place where they come to LIVE! This atmosphere where researched methods engage each resident through activities, therapies, and social interactions combined with affection and support, help our residents come out of the darkness of the disease and connect, participate, and enjoy themselves… on their own terms. ProTem’s exceptional program is designed to reach our residents in ways that create a sort of by-pass around their disease, and help to bring their best selves forward through connecting with areas of their brain that are still functional. So…we have parties, festivals, and daily fun! From late November to late February every year, we decorate outside with Christmas lights the residents can enjoy from the window, or even view outside with a caregiver. The lights replace the color they see during the Spring, Summer, and Fall in the gardens. They have a magical presence all their own, and conjure up memories of joy, love, and excitement our residents felt as children and young adults. Combined with an atmosphere of Christmas music that tugs at their heartstrings, this is a therapeutic and soothing asset to their environment. Each summer, the residents from all five homes and their families, gather together on the beautiful fenced grounds and enjoy a garden party. There is food and music. Chatter and laughter. Games and strolls. Beloved family and new found friends. This is a highlight of the year for our ProTem family and the beautiful grounds enhance the experience for everyone. Life is to be celebrated, don’t you agree? We have raised garden beds so our residents can work with and till the soil, then plant, fertilize, pull weeds, and enjoy the harvest. Through the warm months, working in the gardens is a big part of daily living at ProTem, and our residents enjoy it, whether they experienced gardening in their younger years or not. Watching the cycle of life, from seed, to sprout, to full bloom proves to be fulfilling for them. Seeing life emerge from the work of their hands, they enjoy the camaraderie that develops as they work alongside each other and with caregivers. From various craft projects, watercolors, card games, strolls in the garden, and storytelling, our caregivers plan a main activity every day for the residents to enjoy. Anytime the weather is nice we try to offer those activities in the fresh air and sunshine. Our large, beautifully landscaped gardens stimulate the pleasure centers in our residents’ brains and help them feel more healthy, more vibrant, and ultimately more alive. Once a month, we have a visit from the children of a daycare. They visit all five homes, and the residents and children play games, have conversations, and sing. We do make every effort to nurture each resident, spirit… mind… and body, according to each individual resident’s desires and wishes. In keeping with that goal, we have weekly, spiritual, non-denominational meetings for our residents who desire it. Our residents enjoy a regular spa day experience at no extra charge, and we provide manicures, pedicures, and facials. When we have a resident who is unable to participate in some of the other activities, a facial or manicure and pedicure is just the ticket to involve her, giving her the benefit of touch along with a hand and foot massage, and helping her feel better about her own identity. For our male residents, we offer shaves and facials to help them feel better, and experience healthy stimulation of their skin. They enjoy the pampering just as much as the ladies do! We also have a professional hairdresser who comes and creates a beautiful hairdo for those who are interested. We wash the laundry for our residents, and fold and put away. We include them as much as they’re able, to help them feel useful and to have a sense of some control and dignity in their lives. Residents benefit from a reliable routine broken up by fun activities. We work around their natural routine such as early morning tea or coffee, followed by breakfast. Followed by a late morning cup of coffee for those who prefer that, and later breakfast for the beauty sleepers. A nutritious and easily digested lunch is served at noon to the lilting sounds of period music. But the kitchen is always open. If a resident isn’t hungry at noon…but feels hungry later, he can eat at that point, or skip lunch if he chooses and wait for dinner. A resident may enjoy nutritious afternoon snacks, or just a cup of tea if preferred. Delicious and appealing foods are served for dinner at 5pm. As always, music plays, as residents enjoy their food and good company. If they need help with their meals, caregivers are always at the ready provide the help they need. And since the same caregivers are present in the home daily, the residents become very familiar and comfortable with each one. Anytime a resident wants to help, we include them in meal preparation. This is their home and we enjoy their involvement. Mmmm…smell that bread in the oven..? That’s the aroma of dinner rolls…and it makes your mouth water! As we talk about here, music has a unique ability to penetrate the awareness of a dementia patient like nothing else. 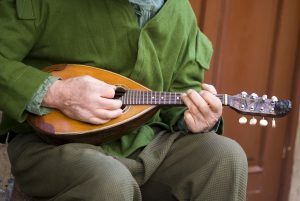 By incorporating music into every activity, the residents find they have a specialized connection with their emotional memories and their past joys. So we bring in musicians periodically so the residents can experience that connection. Some participate by dancing, singing, clapping, or tapping their toes. Our exercise program is called “Walk-and-Roll.” We encourage our residents to stroll inside and outside every day, if possible. This is a friendly and fun competition between the five homes to help them continue to move. Each walk is recorded and at the end of the month, the results are tallied to determine which home walked the most. We have a wonderful time with our residents, and they laugh too. We know your family member would love it here. No matter where he or she is in the progression of the illness, they will be at home here. Call us and let’s talk some more. Every moment of life is a moment we can’t get back. For our residents, nothing could be more true. There is for them little time for appointments, formal traditional therapies, testing, or other “trivialities.” These dear residents are living that time of life when no moment should be wasted. What they have is right now. So we make use of all their RIGHT NOWS to give them reason and joy to live another day and the day after that. To engage, participate, appreciate, and be fulfilled. Our daily functions are worked around their needs and desires. And geared to enrich and expand all their RIGHT NOWS. In the process, their brain cells are stimulated to think and remember, their emotions are brought to life, their skin responds to caring touch, and their hearts are ignited with joy. 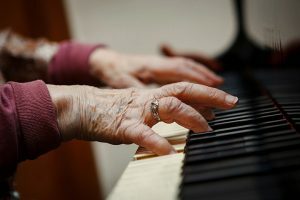 Neurologists at Boston University Alzheimer’s Disease Center have found that music can actually awaken those with Alzheimer’s and other forms of dementia. They’re finding that music therapy in dementia patients not only improves the lives of those with dementia but actually affects their ability to regain memory. This happens in two ways: 1. Music holds emotional memory. So hearing specific music from a specific time of life triggers that person’s emotional memory, which is about the most powerful form of memory we humans have. Emotional memory is located in the area of the amygdala and hippocampus of the brain in the caudal anterior cingulate, which are all parts of the “limbic system.” The limbic system is a group of structures in the brain that processes emotion and stores emotional memory. This is different than episodic memory, where memories of events are stored. Episodic memory is lost early in the course of dementia. What’s amazing about the hippocampus, amygdala, and anterior cingulate of the brain (all parts of the limbic system) is that this area endures through most of the damage of Alzheimer’s much longer than the parts of the brain where the damage is worst. 2. When people learn music, they remember it with muscle memory. Similar to the ability to write your signature. Repetitive movements and activities establish themselves in a part of the brain that isn’t destroyed by dementia. Since music draws on our muscle memory and also pulls at our emotions, it has the power to not only reclaim poignant memories, but it may also help dementia patients to learn new things. Linda McGuire, a gifted opera singer, began working with dementia patients by singing to them in hopes of improving their cognition. She says, “Musical ability and aptitude are two of the last remaining abilities of patients with Alzheimer’s disease.” She also embarked on an education in cognitive and behavioral neuroscience. With her colleague, Dr. Jane Flinn, a neuroscientist at George Mason University in VA, she conducted a study to compare the cognitive benefit of listening to familiar music vs. singing it. They formed a group of residents from an assisted living facility who had mild to moderate dementia, and a second group in a locked unit whose dementia was moderate to severe. Then they divided each group in half. Three days a week, they would have a 50-minute session where Linda led half of each group in singing familiar songs like The Sound of Music, When You Wish Upon a Star, and Somewhere Over the Rainbow. The other half of each group would listen and watch Linda lead. They tested each group’s cognition before they began. And again, after 4 months of these sessions three times a week. The sections of each group that only listened and watched experienced only mild improvement in cognition. But the sections that sang and participated showed significant improvement in cognition, with the most dramatic improvement being demonstrated in the residents with moderate to severe dementia. Their findings were presented at the Society for Neuroscience meeting in San Diego, November 9, 2013. Neurologists at Boston University Alzheimer’s Disease Center tenaciously study why music has so much impact on memory. When they asked a group of people with dementia to memorize lyrics to a song, the patients found it difficult. But when the lyrics were sung to them over and over, they were much more capable of memorizing the song. These researchers discovered it was important that the tune was engaging, and fit well with the lyrics. While they haven’t studied this concept enough to prove it across the board yet, they’re excited to find that music seems to help dementia patients build new memories, which is a breathtaking consideration. Research like this feeds all that we do. Music therapy in dementia patients is demonstrating exciting outcomes. What’s more, our residents love it as much as the caregivers. Music is a special language of love, of hope, and of joy. Your loved one may have times of agitation that come from their frustration with the effects of dementia. Our quest is to learn more as neuroscience discovers more, so we can continue to develop our methods in ways that enhance cognition, memory, fulfillment, and joy. Another aspect of daily living includes art therapy. While this may sound “ho-hum, so everyone scribbles on paper…so what?” It’s far more powerful than a way to just occupy the residents. Neurologists and art therapists have joined together in research to learn what actually happens in the brain during these specialized art experiences. A growing body of evidence through studies and practice has revealed this non-pharmacological approach with dementia sufferers reduces cognitive decline and increases the quality of life. Ellen Greene Stewart, in her paper published in the Journal of the American Art Therapy Association, wrote that for dementia patients who have severe damage in some parts of their brain, art therapy helps them express themselves using other undamaged brain regions. Her paper, Art Therapy and Neuroscience Blend: Working with Patients Who Have Dementia, she reviews neuroscience studies about dementia and how art therapy relieves anxiety, depression, and agitation, as well as improving cognition and slowing decline. She goes on to show how the loss of language from dementia can be replaced through other creative methods, such as color, texture, and form. 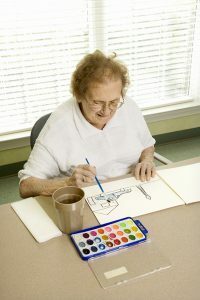 To bring all the studies and papers home to roost here at ProTem, the simplest explanation is that various forms of art are used to help our residents express themselves. Since the progression of dementia interferes with verbal communication until it shuts down completely, the person with dementia is able to use art to communicate without words. It may be watercolors, colored markers, poetry, prose, skits, music and dance, or a combination of these things. Daniel Potts, MD saw that when his father who had dementia was given the opportunity to paint or do crafts, he could tell stories of his earlier life in beautiful ways. And they’ve found when music and dance are combined with the artwork, the experience is deeper and lasts longer. In fact, his father painted over 100 pictures of his childhood and young adult life, and his family was overwhelmed with joy to see what he created. You see, they had no idea he had artistic talent. After his father’s death, Dr. Potts founded Cognitive Dynamics to further the implementation of music and art therapy in nursing homes. Before these things were understood, people with dementia were locked in a facility and their basic physical needs were met. As they advanced in the disease, they seemed to disappear. Sadly, that still goes on today in far too many memory care facilities. But, it’s a beautiful thing to watch our residents engage in their art, watch their focus and concentration improve as they work, and see their joy in completing it. These projects foster dignity and joy in the residents. They also restore their own sense of value, to create something of beauty for the world. We enjoy our reminiscence times. 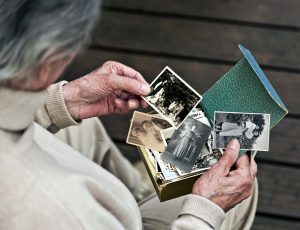 This is a form of therapy we may use in discussion, or in conjunction with art and music therapies to help our residents think back and connect the dots of memory…from their own story. Using photos, stories, items brought from home, and archived music, we talk about what these things remind them of, what comes to mind? Our residents enjoy these times, and they seem to enjoy its benefits for the rest of the week. Studies have demonstrated that reminiscing improves their cognition, their mood, and their behavior. Sometimes we have the opportunity with a resident to spend one-on-one time using music, song, and art, to create their own story in the form of a book they can continue to enjoy. The joy of pet therapy is infused with benefits for people with dementia. Pets have been used with dementia patients for a number of years, because they’re such a help, so calming, and so accepting. 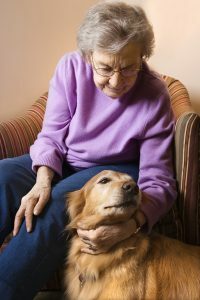 Since dementia causes symptoms like apathy, irritability, restlessness, depression, and changes in mood, pet therapy can counteract these symptoms in a variety of ways. Just being around an animal can be soothing for all of us who love them. Time with pets makes us want to love them, care for them, and make them happy. And that, in turn, brightens anyone’s mood. Many with dementia have lost their ability to communicate verbally. Pets tend to communicate on a much deeper and non-verbal level, and people with dementia understand and connect with that. Pets also provide rich emotional support. Dementia patients usually see them as non-threatening, and will interact with them more freely than with people. The presence of a pet causes a cascade reaction in chemicals in the brain that reduces the levels of the stress hormone cortisol while increasing “feel-good” hormones. So pets help to reduce depression and anxiety and improve quality of life. Being with a pet helps to stimulate and reminisce about pets he or she previously had, as well as sparking fun, playfulness, and joy. We have a caregiver who has a certified therapy dog, and she brings him to work every day she’s on duty. Her first task of the day is to take her little furry friend to greet each resident in the house. The residents love him. Doll therapy is available for those residents who are interested. Those who show no interest are given freedom to decide. Doll therapy is useful for some residents who respond to the doll in a positive way. Since anxiety and stress is part of the dementia diagnosis for many, having a doll to care for relieves that anxiety for many. There are times when a resident’s family is uncomfortable seeing their mother or father with a doll. But we try to help them see that their loved one has been anxious, and struggled to find purpose. And when they connect with a doll, the doll is real to them. We don’t use the term “doll” as it could be upsetting or embarrassing to the resident. So we refer to “the baby” or “Molly” …or whatever name the resident has given the doll. But for some residents having this doll to feed, dress, and care for, gives them great comfort. We remind the family that the loved one doesn’t realize the doll isn’t real, and the purpose they experience in caring for it helps them to relax and feel fulfilled. Sometimes an agitated resident can be given a doll and a doll bed, and the agitation melts away. A woman whose life was caring for children and grandchildren might feel more like herself holding a baby. Others just want one to sleep with. We never push the dolls on anyone, but rather just make them available, for the resident to connect with on their own. Anything that helps a resident to feel more comfortable, more at home, and more fulfilled, is what we endeavor to provide. Since this is home to our residents, we take care to ensure our residents are as comfortable as they should be at home. Our caregivers cooks in the kitchen, which is in the center of our home, and the residents can help if they like or just enjoy the aromas from their recliners or chairs. We focus on wholesome and nutritious foods that are easily digestible. Breakfast is served when the resident wakes up. Those who are awake at 8am can eat together and enjoy the company of the others. But if the resident sleeps past that time, we prepare breakfast at that time. Lunch is served at noon, and dinner at 5pm. If a resident ate a late breakfast, we’re happy to provide a later lunch. And if that resident really doesn’t want to eat lunch, that’s ok too. There are times when a resident is agitated because of their disease, and needs a private time to rest and relax. At those times we serve their meal in their room, where there is less stimulation and they feel secure. Our specially-trained nutrition consultant works with us to create a four-week rotating menu of home-cooked meals that comply with Canada’s Food Guide and the needs and preferences of our residents. Because each home has only 10 residents, it’s easy for us to be familiar with likes and dislikes and special needs of each resident…just as it is in any family. This includes the individual’s portion size and the time required to eat. When a resident has special needs or conditions, such as food allergies, celiac disease, diabetes, lactose intolerance, diverticulitis, or swallowing impairments caused by stroke or neurological disorders, we create a special meal plan for that resident to accommodate those individual needs. There are nutritious snacks available to our residents for mid-afternoon or bedtime… and if a resident is hungry at night, they can eat then, too. Our residents are our focus, and adapting to their needs and preferences is our purpose. Each home has 10 bedrooms, arranged around a central living area and kitchen. There are chairs, recliners, and a piano in the living area. Several round tables surrounded by comfortable captain’s chairs are arranged in the dining area. The kitchen is like the kitchen in any home, with modern conveniences, but without anything that smacks of commercial facilities. This is a home…and it looks and feels like one. Each bedroom holds a bed, a chest, a nightstand, and a chair. Not enough to clutter, but plenty to provide a resident’s needs. Our residents are free to enjoy the quiet of their rooms when they prefer or to sit with other residents in the living area, the dining area, or on the patio with caregivers. The patio is furnished with a swing for 2-3 people and a variety of chairs. Since some residents sit in wheelchairs, those can be assisted outside so the resident can enjoy conversation and fresh air. Caregivers are always present, looking after the needs of each resident, encouraging conversation, or telling a story. "ProTem has a reputation of being the best." "I would highly recommend the move. The staff has the time for the care with low resident-caregiver ratio." Our five small homes are located in the Mapleton area of Moncton.